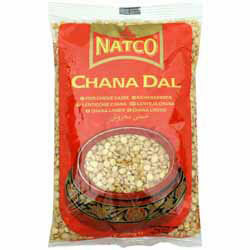 Chana Dal is also called Bengal Gram, Kadale Bele and Kadalai Paruppu. It is an important lentil in Indian cooking as it is so tasty, robust and versatile. It resembles the yellow split pea in colour and size, although it is smaller and sweeter, with a nutty flavour. Chana Dal is often combined with sweeter vegetables, such as pumpkin and zucchini. "Dear Spices of India, Excellent service, will use again..."